Easy Pinata Apple Salsa is a delightful treat any time of the year and absolutely perfect for your Cinco de Mayo celebrations – just 3 weeks away! Sweet and savory with a touch of heat, it is refreshing and brings brightness to any meal. The Pinata apple is Stemilt Grower’s signature variety. In the 1970s, German researchers crossed three heirloom apples, Golden Delicious, Cox’s Orange Pippin, and Duchess of Oldenburg to create a new variety, the Piñata (a blending of the names Pinova and Sonata). In 2004, the Mathison family of Stemilt Growers purchased the rights to grow and market the apple in the U.S. Though it is tempting to throw a lot of ingredients into salsas, keep it simple and let the beauty of the apples shine! And be sure to use the best apples you can find, preferably Stemilt’s Pinata apples – crisp and juicy with a tangy-tart taste, they pair beautifully with the savory components of onions, jalapenos, and bell peppers. I love the freshness of this Piñata apple salsa and the way it enhances anything you add it to. Today I pared it with Green Chile Pork Tacos but it would be great with chicken or fish tacos too. You could also serve it over chops or alongside grilled meats. Don’t you love its versatility! This took about 15 minutes to assemble – so quick and easy! Use a sharp paring knife for mincing and a chef’s knife for chopping and you will have everything ready in no time. Make your taco filling a day or two ahead giving the flavors time to meld – and you can have your Cinco de Mayo fixin’s ready in a flash! If you use gluten-free corn tortillas, your whole meal will be gluten-free without anyone knowing. So delicious that everyone will be asking for seconds! 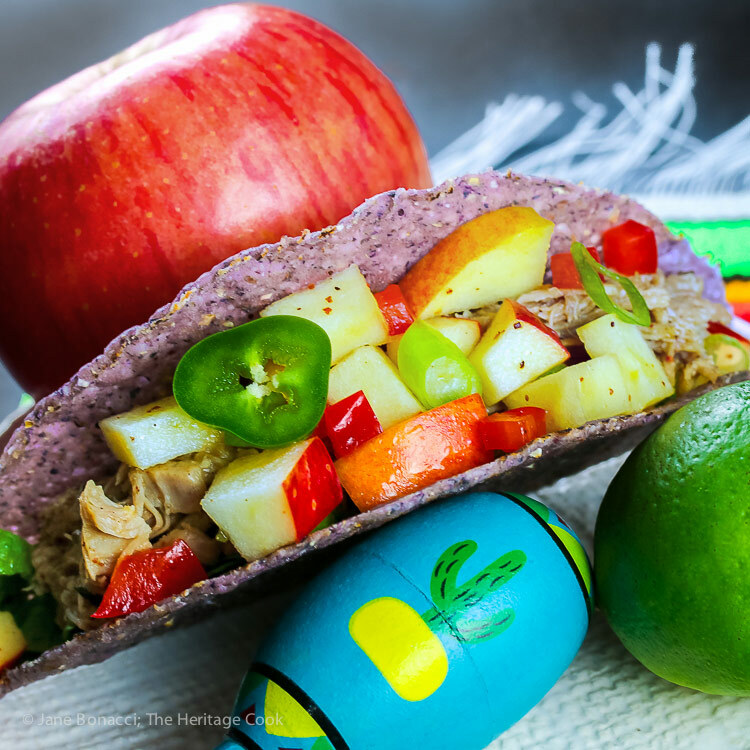 Enjoy your holiday celebrations, especially today’s Pinata Apple Salsa and Pork Tacos, and be sure to check out Stemilt’s website for even delicious more ideas! Be sure that all the apple pieces are covered with the lime juice mixture to keep them from browning. The salsa is naturally gluten-free, but be sure to use certified gluten-free tortillas to make the tacos. Mission brand has gluten-free corn tortillas. 1-1/2 cups fresh apple cubes, such as Stemilt's Piñata apples! In a small bowl, whisk together the lime juice, honey, olive oil and chili powder. Taste and adjust with more honey or lime juice as needed. Combine the apples, bell peppers, onions, and jalapenos in a medium bowl. Pour the dressing over the top. Toss together until evenly coated. Taste and add salt and pepper as desired. I served this salsa with Green Chile Pork Tacos but it would be great with chicken or fish tacos too. * Note: 30 seconds in the microwave oven will give you much more juice from your limes! Disclosure: I received produce to sample and develop a recipe for Stemilt Growers. Thank you for supporting my partnerships with brands that I love to work with and whose products I use regularly. As always, all opinions are my own.